Why I read this book: I was at a talk Sunny gave at college and I instantly went out and bought her book. "I now know from hard-earned experience that each of us, male or female, must at some point take responsibility for ourselves and our lives. That's the way it is. " 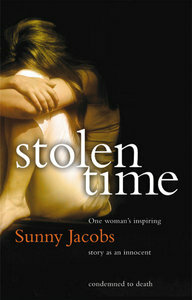 This is the biography of Sunny Jacobs, a woman who, at the age of 28 she was sentenced to death for her role in the murders of two policemen in Florida, a crime she never committed. Her death sentence was later commuted to life in prison, and in total, she spent seventeen years in jail, five of which were in solitary confinement. It is an incredibly moving book and makes you think long and hard about whether the death penalty should be allowed. The book opens with Sonia describing her early years- she got pregnant as a teenager and swiftly married the father of the future child, Kenny. The marraige didn't work- both were too young and immature and they ultimately separated. She moved to Miami in 1973 where she became involved with the mysterious, charismatic and troubled Jesse Tafero. The two moved in together and began trying to make things work as a family. By 1976 they'd been living together for three years and had a child together, their daughter Tina. The night that would shape the rest of their lives happened in 1976 when they were driving to Palm Beach with their friend Rhodes. Two cops pulled them over and a shoot-off happened that left both of the policemen dead. Despite there being absolutely no evidence that either of them took any part in the crime- in fact there was plenty of evidence that neither of them had done it- both were sentenced to death. Her children were taken from her and put into her parents care. The book then goes on to describe her life in jail. She spent five years in solitary confinement where she passed the time doing yoga and meditating. She continued her relationship with Jesse, where they sent each other letters of love, hope and despair. Ultimately her death sentence was overturned to life in jail. Her parents died in a tragic aeroplane crash in 1982. Naturally she is devestated and her children are put into care. She then describes the horrific murder of her partner Jesse. Jesse was given the electric chair, where it took 13 minutes for the state of Florida to murder him- flames came out of his head while he was still alive. The inhumanity of his death can scarcely be described. Finally, in 1992 after a lengthy court process, Sonia's sentence was overturned and she was released. "In 1976, when I went in, I was a young mother, a daughter and a wife. When I came out, in 1992, I was an orphan, a widow and a grandmother. "Sonia is an incredibly inspirational person and her courage, intelligence, humanity and wit shine through in every page. What she suffered is unimaginable- it is absolutely disgusting that she was sentenced to seventeen years in jail for a crime she never committed, and her husband was brutally murdered for a crime too was innocent of. Although she has plenty to be angry and bitter about, she never loses her sense of humour, she keeps herself busy and she never ever loses her incredible sense of humanity. I was lucky enough to meet this amazing woman last year when she and her partner Peter Pringle gave a talk at my university. I highly, highly recommend this book. It is a womans story of being convicted for a crime despite ones innocence, as well as a broader reflection on the death penalty as a whole. Wow! That book, and her story, sound absolutely incredible! Her story is shocking and very, very sad. I hope Sonia has managed to get back together with her whole family. I don't think I will read this book any time soon (as I am not a fan of biographies, autobiographies, memoirs etc), but I'm glad I at least found out about this story from you. Thank you.